Sleek. Some of the vehicles belonging to MPs at Parliament yesterday. Legislators are given these facilities to do constituency work. Parliament — MPs are smiling all the way to the bank after the government authorised the release of an extra Shs45b to Parliament, with each of the 449 lawmakers set to get an additional Shs100m, ostensibly to buy cars for constituency travels. In a June 13 letter titled: 'Additional cash limit of Shs45.8b for the Parliamentary Commission', Mr Keith Muhakanizi, the Secretary to the Treasury, authorised Ms Jane Kibirige, the Clerk to Parliament, to spend the cash as part of non-wage recurrent budget in the fourth quarter of the Financial Year 2016/2017. The clearance comes barely two weeks to the end of the Financial Year. Correspondences between Parliament and the Finance ministry, which Saturday Monitor has seen, indicate that the matter of an enhanced car grant for MPs in the 10th Parliament was hammered out during a meeting between President Museveni and the Parliamentary Commission at State House Entebbe on August 12, 2016. In a May 25, letter to Finance minister Matia Kasaija, the Clerk to Parliament referred to the meeting with the President and requested for Shs77b, which would be paid out in three instalments of Shs12.2b, Shs19.5b, and Shs45.8b. "As you are aware, the Parliamentary Commission met the President on August 12 2016 to discuss the options for raising motor vehicles funds for MPs. It was agreed that the funds for MPs vehicles be raised through re-allocation and deferring MPs gratuity for FY 2016/17," Ms Kibirige's letter reads. In the letter, Ms Kibirige indicated that the Shs19b will be for MPs gratuity and another Shs45b for the "2nd phase of Members of Parliament vehicles." The additional Shs100m for cars for the 449 MPs in the 10th Parliament now means each MP will pocket as much as Shs200m as part of the car grant. In October 2016, each MP took home Shs100m after the Finance Ministry released Shs64.5b, but some of the MPs with pending election petitions in court were skipped, sparking off an angry reaction from the affected legislators. The Parliamentary Commission would later trim the parliamentary committees' budgets to avail money for the troubled lawmakers. In this phase of payments, however, the MPs appear to be indiscriminately paid, regardless of who has a pending court action. MPs in the 9th Parliament took Shs100m each, but their successors insisted the figure has to be revised upwards to cater for the appreciating dollar rate. An MP, who did not want to be named in order to speak freely on the issue, yesterday confirmed that his bank has sent him an alert about Shs100m wired to his account, while another MP said he learnt of the Shs100m from an MPs' WhatsApp group. 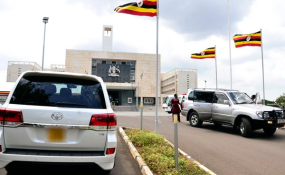 The issue of the car grant for MPs has long been the cause of a frosty relationship between Parliament and the ministry of Finance and technocrats in the Treasury were non-committal about the purpose of the Shs45.8b. Mr Muhakanizi declined to explain the purpose of the Shs45.8b, saying he only signed a letter drafted by Mr Kenneth Mugambe, the director of Budget at the Finance ministry. But Mr Mugambe deflected the questions regarding the expenditure to Parliament, saying the accounting officer of the receiving institution should come clean on what the money is for. "Ask Parliament; the money has gone to Parliament. The ministry (Finance) has released the money and the spending institution (Parliament) is aware of the activity for which they requested for the release," Mr Mugambe said. But the State minister for Finance (Planning), Mr David Bahati, who has been leading the Executive in meetings with the Parliament Commission over the car grant, also refused to comment. "Talk to the Clerk to Parliament and she will explain," Mr Bahati said. Ms Kibirige said she had not been to office this week and could not respond to inquiries about the money for the car grant. With 22 new districts expected to be created before the expiry of the 10th Parliament by 2021, the additional MPs will require another Shs4b minimum, raising the taxpayers expenditure on MPs cars from about Shs40b (Shs103m each) in the 9th Parliament to nearly Shs115b in the 10th Parliament.